Police are seen standing guard during a protest against the Chinese Copper Mine Wanbao Co.
A villager protesting the expansion of a Chinese copper mine in Myanmar was shot and killed on Monday, witnesses said, in the latest bout of violence to mar the project, New York Times reports. Villagers reached by telephone said the slain woman, Daw Khin Win, 56, was shot by security forces as the police and Chinese employees of the mine were erecting a fence in one of the villages where land had been seized for the expansion of the operation. More than a dozen people were wounded in clashes with security forces, witnesses said. 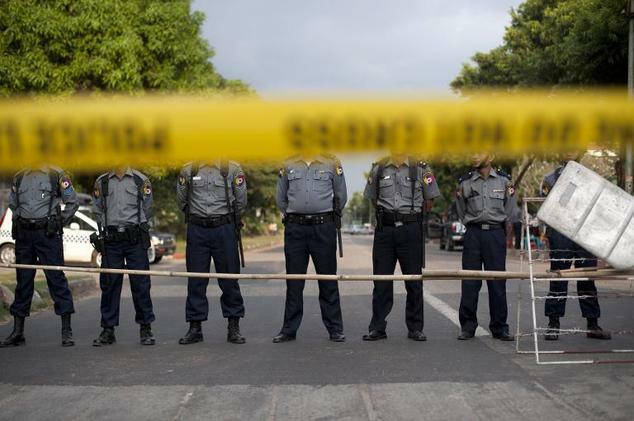 U Ye Htut, the spokesman for the government of Myanmar, said the police were “attacked by villagers” as construction of the fence got underway. “Tension has been building for weeks,” he said. Two villagers were shot and wounded in the same town, Moegyo Pyin, this month. The project has been a focal point of criticism of Chinese companies in Myanmar, which have been accused of plundering timber and other natural resources in the country.